Step into the world of tropical rainforests with its creeks and rivers. Enjoy nature in its purest form and travel across this amazing creek near Paramaribo with your own kayak and be swept away (figuratively) by nature’s rhythm! Coropina is less than an hour’s drive from Paramaribo towards the airport. It is a wonderful area where we get to see many special animals while traveling, such as monkeys, capybaras, caimans and a wide variety of amazing birds, including various parrot species. It is a watery landscape, comprised mostly of swamps linked together by creeks. This a wonderful adventure for those seeking it, for young and old who enjoy nature and adventure. We gather up at ‘Cycling in Suriname’ and travel by car, with the kayaks on board, to the journey’s starting point: Coropina Creek. This is where we load up our kayaks and begin our kayak journey to the Hanover plantation. We paddle our way across the sometimes narrow and dense creek. This is also a lovely opportunity to encounter special animals or witness the colorful splendor of the loudly screeching parrots. We have lunch at an amazing spot in the middle of the forest on the creek’s banks, and what could be nicer than enjoying the sounds of the jungle while enjoying a great meal, knowing there’s no one around for miles? 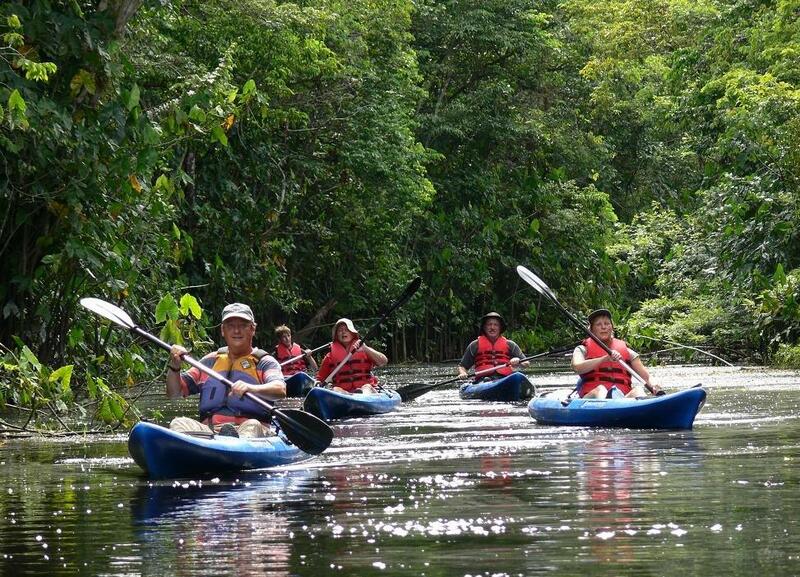 Including: Experienced guide, all transport, the all-inclusive use of kayaks, lunch, medical kit and safety jackets.